This article is about the former Greek president who lived from 1907 to 1998. For his nephew, see Kostas Karamanlis. Konstantinos G. Karamanlis (Greek: Κωνσταντίνος Γ. Καραμανλής, pronounced [konstaˈdinos karamanˈlis]; 8 March 1907 – 23 April 1998), commonly anglicised to Constantine Karamanlis or just Caramanlis, was a four-time Prime Minister and twice President of the Third Hellenic Republic, and a towering figure of Greek politics, whose political career spanned much of the latter half of the 20th century. His is recognised for his successful restoration of Democracy after the Greek military junta and by establishing the Third Hellenic Republic. A devoted pro-Europeanist, he is credited also for the country's accession to the European Communities. In 1978 he was awarded the Charlemagne Prize. His supporters still laud him as the charismatic Ethnarches (National Leader). Karamanlis was born in the village of Proti, near the city of Serres, Macedonia, which was then part of the Ottoman Empire. He became a Greek citizen in 1913, after Macedonia was annexed by Greece, Bulgaria and Serbia, in the aftermath of the Second Balkan War. His father was Georgios Karamanlis, a teacher who fought during the Greek Struggle for Macedonia, in 1904–1908. After spending his childhood in Macedonia, he went to Athens to attain his degree in law. He practised law in Serres, entered politics with the conservative People's Party and was elected Member of Parliament for the first time in the 1936 election at the age of 28. Health problems made him not participate in the Greco-Italian War. During the Axis occupation, he spent his time between Athens and Serres, while in July 1944, he left to the Middle East to join the Greek government in exile. Karamanlis at an opening of a pipeline at Keratsini. After World War II, Karamanlis quickly rose through the ranks of Greek politics. His rise was strongly supported by fellow party-member and close friend Lambros Eftaxias, who served as Minister for Agriculture under the premiership of Konstantinos Tsaldaris. Karamanlis's first cabinet position was Minister for Labour in 1947 under the same administration. In 1951, along with most prominent members of the People's Party, Karamanlis joined the Greek Rally of Alexandros Papagos. When this party won power in 1951, Karamanlis became Minister of Public Works in the Papagos administration. He won the admiration of the US Embassy for the efficiency with which he built road infrastructure and administered American aid programs. When Papagos died after a brief illness (1955), King Paul of Greece appointed the 48-year-old Karamanlis as Prime Minister. The King's appointment took the Greek political world by surprise, as it bypassed Stephanos Stephanopoulos and Panagiotis Kanellopoulos, two senior Greek Rally politicians who were widely considered as the heavyweights most likely to succeed Papagos. After becoming Prime Minister, Karamanlis reorganized the Greek Rally as the National Radical Union. One of the first bills he promoted as Prime Minister implemented the extension of full voting rights to women, which stood dormant although nominally approved in 1952. Karamanlis won three successive elections (1956, 1958 and 1961). In 1959 he announced a five-year plan (1960–64) for the Greek economy, emphasizing improvement of agricultural and industrial production, heavy investment on infrastructure and the promotion of tourism, setting the bases for the so-called Greek economic miracle. On the international front, Karamanlis abandoned the government's previous strategic goal for enosis (the unification of Greece and Cyprus) in favour of independence for Cyprus. In 1958, his government engaged in negotiations with the United Kingdom and Turkey, which culminated in the Zurich Agreement as a basis for a deal on the independence of Cyprus. In 1959 the plan was ratified in London by the Cypriot leader Makarios III. Max Merten was Kriegsverwaltungsrat (military administration counselor) of the Nazi German occupation forces in Thessaloniki. He was convicted in Greece and sentenced to a 25-year term as a war criminal in 1959. On 3 November of that year, Merten benefited from an amnesty for war criminals, and was set free and extradited to the Federal Republic of Germany, after political and economic pressure from West Germany (which, at the time, hosted thousands of Greek economic immigrants). Merten's arrest also enraged Queen Frederica, a woman with German ties, who wondered whether "this is the way mister district attorney understands the development of German and Greek relations". In Germany, Merten was eventually acquitted from all charges due to "lack of evidence." On 28 September 1960 German newspapers Hamburger Echo and Der Spiegel published excerpts of Merten's deposition to the German authorities where Merten claimed that Karamanlis, the then Minister for the Interior Takos Makris and his wife Doxoula (whom he described as Karamanlis's niece) along with then Deputy Minister of Defense George Themelis were informers during the Nazi occupation of Greece. Merten alleged that Karamanlis and Makris were rewarded for their services with a business in Thessaloniki which belonged to a Greek Jew sent to the Auschwitz concentration camp. He also alleged that he had pressured Karamanlis and Makris to grant amnesty and release him from prison. Karamanlis rejected the claims as unsubstantiated and absurd, and accused Merten of attempting to extort money from him prior to making the statements. The West German government also decried the accusations as calumniatory and libelous. Karamanlis accused the opposition party of instigating a smear campaign against him. Although Karamanlis never pressed charges against Merten, charges were pressed in Greece against Der Spiegel by Takos and Doxoula Makris and Themelis, and the magazine was found guilty of slander in 1963. Merten did not appear to testify during the Greek court proceedings. The Merten Affair remained at the centre of political discussions until early 1961. Merten's accusations against Karamanlis were never corroborated in a court of law. Historian Giannis Katris, an ardent critic of Karamanlis, has argued that Karamanlis should have resigned the premiership and pressed charges against Merten as a private individual in German courts, in order to fully clear his name. Nonetheless, Katris rejects the accusations as "unsubstantiated" and "obviously fallacious". 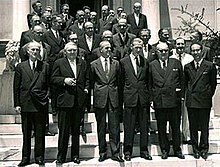 Konstantinos Karamanlis, his cabinet with Deputy Prime Minister Panagiotis Kanellopoulos (front left) and German Vice-Chancellor Ludwig Erhard with a German/European delegation during a visit by Erhard to sign the protocols of Greece's Treaty of Association with the European Economic Community (EEC) in 1961. Paul-Henri Spaak is second from the right (front row). Karamanlis as early as 1958 pursued an aggressive policy toward Greek membership in the EEC. He considered Greece's entry into the EEC a personal dream because he saw it as the fulfillment of what he called "Greece's European Destiny". He personally lobbied European leaders, such as Germany's Konrad Adenauer and France's Charles de Gaulle followed by two years of intense negotiations with Brussels. His intense lobbying bore fruit and on 9 July 1961 his government and the Europeans signed the protocols of Greece's Treaty of Association with the European Economic Community (EEC). The signing ceremony in Athens was attended by top government delegations from the six-member bloc of Germany, France, Italy, Belgium, Luxemburg and the Netherlands, a precursor of the European Union. Economy Minister Aristidis Protopapadakis and Foreign Minister Evangelos Averoff were also present. German Vice-Chancellor Ludwig Erhard and Belgian Foreign Minister Paul-Henri Spaak, a European Union pioneer and a Karlspreis winner like Karamanlis, were among the European delegates. This had the profound effect of ending Greece's economic isolation and breaking its political and economic dependence on US economic and military aid, mainly through NATO. Greece became the first European country to acquire the status of associate member of the EEC outside the six nation EEC group. In November 1962 the association treaty came into effect and envisaged the country's full membership at the EEC by 1984, after the gradual elimination of all Greek tariffs on EEC imports. A financial protocol clause included in the treaty provided for loans to Greece subsidised by the community of about $300 million between 1962 and 1972 to help increase the competitiveness of the Greek economy in anticipation of Greece's full membership. The Community's financial aid package as well as the protocol of accession were suspended during the 1967–74 junta years and Greece was expelled from the EEC. As well, during the dictatorship, Greece resigned its membership in the Council of Europe fearing embarrassing investigations by the Council, following torture allegations. Soon after returning to Greece during metapolitefsi Karamanlis reactivated his push for the country's full EEC membership in 1975 citing political and economic reasons. Karamanlis was convinced that Greece's membership in the EEC would ensure political stability in a nation having just undergone a transition from dictatorship to Democracy. In May 1979 he signed the full treaty of accession. Greece became the tenth member of the EEC on 1 January 1981 three years earlier than the original protocol envisioned and despite the freezing of the treaty of accession during the junta (1967–1974). In the 1961 elections, the National Radical Union won 50.8 percent of the popular vote and 176 seats. The elections were denounced by both main opposition parties, EDA and the Centre Union, who refused to recognise the result based on numerous cases of voter intimidation and irregularities, such as sudden massive increases in support for ERE against historical patterns, or the voting by deceased persons. The Centre Union alleged that the election result had been staged by the shadowy "para-state" (παρακράτος) agents, including the army leadership, the Greek Central Intelligence Service, and the notoriously right-wing National Guard Defence Battalions, according to a prepared emergency plan code-named Pericles. Although irregularities certainly occurred, the existence of Pericles was never proven, nor is it certain that the interference in the elections radically influenced the outcome. Nevertheless, Centre Union leader George Papandreou initiated an "unrelenting struggle" ("ανένδοτος αγών") until new and fair elections were held. The final straw for Karamanlis'government was his clash with the Palace in summer 1963, over the projected visit of the royal pair to Britain. Karamanlis opposed the trip, as he feared that it would provide the occasion for demonstrations against the political prisoners still held in Greece since the Civil War. Karamanlis' relations with the Palace had been declining for some time, particularly with Queen Frederika and the Crown Prince, but the Prime Minister also clashed with King Paul over the latter's opposition to proposed constitutional amendments that would empower the government, the extravagant lifestyle of the royal family, and the near-monopoly that the King claimed over control of the armed forces. When the King rejected his advice to postpone the trip to London, Karamanlis resigned and left the country. In his absence, ERE was led by a committee composed of Panagiotis Kanellopoulos, Konstantinos Rodopoulos, and Panagis Papaligouras. In the 1963 election, the National Radical Union, under his leadership, was defeated by the Centre Union under George Papandreou. Disappointed with the result, Karamanlis fled Greece under the name Triantafyllides. He spent the next 11 years in self-imposed exile in Paris, France. Karamanlis was succeeded by Panagiotis Kanellopoulos as the ERE leader. In 1966, Constantine II of Greece sent his envoy Demetrios Bitsios to Paris on a mission to convince Karamanlis to return to Greece and resume a role in Greek politics. According to uncorroborated claims that were made by the former monarch only after both men had died, in 2006, Karamanlis replied to Bitsios that he would return under the condition that the King were to impose martial law, as was his constitutional prerogative. U.S. journalist Cyrus L. Sulzberger has separately claimed that Karamanlis flew to New York to visit Lauris Norstad and lobby US support for a coup d'état in Greece that would establish a strong conservative regime under himself; Sulzberger alleges that Norstad declined to involve himself in such affairs. Sulzberger's account, which unlike that of the former King was delivered during the lifetime of those implicated (Karamanlis and Norstad), rested solely on the authority of his and Norstad's word. When in 1997, the former King reiterated Sulzberger's allegations, Karamanlis stated that he "will not deal with the former king's statements because both their content and attitude are unworthy of comment." The deposed King's adoption of Sulzberger's claims against Karamanlis was castigated by left-leaning media, typically critical of Karamanlis, as "shameless" and "brazen". It bears noting that, at the time, the former King referred exclusively to Sulzberger's account, to support the theory of a planned coup by Karamanlis, and made no mention of the alleged 1966 meeting with Bitsios, which he would refer to only after both participants had died and could not respond. On 21 April 1967, constitutional order was usurped by a coup d'état led by officers around Colonel George Papadopoulos. The King accepted to swear in the military-appointed government as the legitimate government of Greece, but launched an abortive counter-coup to overthrow the junta eight months later. Constantine and his family then fled the country. In 2001, former agents of the Eastern German secret police, the Stasi, claimed to Greek investigative reporters that during the Cold War, they had orchestrated an operation of evidence falsification, to present Karamanlis as having planned a coup and thus damage his reputation in an apparent disinformation propaganda campaign. The operation allegedly centered on a falsified conversation between Karamanlis and Strauss, a Bavarian officer of the King. They also alleged that a photograph of the former New Democracy leader Konstantinos Mitsotakis, standing next to a uniformed Nazi officer, repeatedly published by the PASOK-leaning Greek daily Avriani, was really a photomontage that had been fabricated in Bulgaria. Their disclosures have not been challenged to this day. In 1974, the invasion of Cyprus by the Turks led to the collapse of the military junta. On 23 July 1974, President Phaedon Gizikis called a meeting of old guard politicians, including Panagiotis Kanellopoulos, Spiros Markezinis, Stephanos Stephanopoulos, Evangelos Averoff and others. The heads of the armed forces also participated in the meeting. The agenda was to appoint a national unity government that would lead the country to elections. Former Prime Minister Panagiotis Kanellopoulos was originally suggested as the head of the new interim government. He was the interim Prime Minister originally deposed by the dictatorship in 1967 and a distinguished politician who had repeatedly criticized Papadopoulos and his successor. Raging battles were still taking place in Cyprus' north when Greeks took to the streets in all the major cities, celebrating the junta's decision to relinquish power before the war in Cyprus could spill all over the Aegean. But talks in Athens were going nowhere with Gizikis' offer to Panagiotis Kanellopoulos to form a government. Nonetheless, after all the other politicians departed without reaching a decision, Evangelos Averoff remained in the meeting room and further engaged Gizikis. He insisted that Karamanlis was the only political personality who could lead a successful transition government, taking into consideration the new circumstances and dangers both inside and outside the country. Gizikis and the heads of the armed forces initially expressed reservations, but they finally became convinced by Averoff's arguments. Admiral Arapakis was the first, among the participating military leaders, to express his support for Karamanlis. After Averoff's decisive intervention, Gizikis decided to invite Karamanlis to assume the premiership. Throughout his stay in France, Karamanlis was a vocal opponent of the Regime of the Colonels, the military junta that seized power in Greece in April 1967. He was now called to end his self-imposed exile and restore democracy to the place that was originally invented. Upon news of his impending arrival cheering Athenian crowds took to the streets chanting: Έρχεται! Έρχεται! He is coming! He is coming! Similar celebrations broke out all over Greece. Athenians in their thousands also went to the airport to greet him. 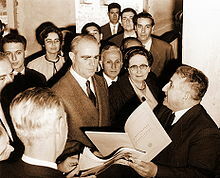 Karamanlis was sworn-in as Prime Minister under President pro tempore Phaedon Gizikis who remained in power in the interim, till December 1974, for legal continuity reasons until a new constitution could be enacted during metapolitefsi and was subsequently replaced by duly elected President Michail Stasinopoulos. During the inherently unstable first weeks of the metapolitefsi, Karamanlis was forced to sleep aboard a yacht watched over by a destroyer for the fear of a new coup. Karamanlis attempted to defuse the tension between Greece and Turkey, which were on the brink of war over the Cyprus crisis, through the diplomatic route. Two successive conferences in Geneva, where the Greek government was represented by George Mavros, failed to avert a full-scale invasion and occupation of 37 percent of Cyprus by Turkey on 14 August 1974. As a protest, Karamanlis led the country temporarly outside of the military branch of NATO. The steadfast process of transition from military rule to a pluralist democracy proved successful. During this transition period of the metapolitefsi, Karamanlis legalized the Communist Party of Greece (KKE) that was banned since the civil war. The legalization of the communist party was considered by many as a gesture of political inclusionism and rapprochement. At the same time he also freed all political prisoners and pardoned all political crimes against the junta. Following through with his reconciliation theme he also adopted a measured approach to removing collaborators and appointees of the dictatorship from the positions they held in government bureaucracy, and declared that free elections would be held in November 1974, four months after the collapse of the Regime of the Colonels. In the 1974 elections, Karamanlis with his newly formed conservative party, named New Democracy obtained a massive parliamentary majority and was elected Prime Minister. The elections were soon followed by the 1974 plebiscite on the abolition of the monarchy and the establishment of a Hellenic Republic, the televised 1975 trials (Greek Junta Trials) of the former dictators (who received death sentences for high treason and mutiny that were later commuted to life incarceration) and the writing of the new Constitution. In 1977, New Democracy again won the elections, and Karamanlis continued to serve as Prime Minister until 1980. The external policy of his governments, for the first time since the war, favoured a multi-polar approach between US, Soviet Union and the Third World; a policy continued also by his successor Andreas Papandreou. Under Karamanlis's premiership, his government also undertook numerous nationalizations in several sectors, including banking and transportation. Karamanlis's policies of economic statism, which fostered a large state-run sector, have been described by many as socialmania. Signing at Zappeion of the documents for the accession of Greece to the European Communities in 1979. Following his signing of the Accession Treaty with the European Economic Community (now the European Union) in 1979, Karamanlis relinquished the Premiership and was elected President of the Republic in 1980 by the Parliament, and in 1981 he oversaw Greece's formal entry into the European Economic Community as its tenth member. He served until 1985 then resigned and was succeeded by Christos Sartzetakis. In 1990 he was re-elected President by a conservative parliamentary majority (under the conservative government of then Prime Minister Konstantinos Mitsotakis) and served until 1995, when he was succeeded by Kostis Stephanopoulos. Karamanlis retired in 1995, at the age of 88, having won 5 parliamentary elections, and having spent 14 years as Prime Minister, 10 years as President of the Republic, and a total of more than sixty years in active politics. For his long service to democracy and as a pioneer of European integration from the earliest stages of the European Union, Karamanlis was awarded one of the most prestigious European prizes, the Karlspreis, in 1978. He bequeathed his archives to the Konstantinos Karamanlis Foundation, a conservative think tank he had founded and endowed. Karamanlis died after a short illness in 1998, at the age of 91. His nephew Kostas Karamanlis later became the leader of the New Democracy party (Nea Demokratia) and Prime Minister of Greece from 2004 to 2009. Karamanlis has been praised for presiding over an early period of fast economic growth for Greece (1955–63) and for being the primary engineer of Greece's successful bid for membership in the European Union. His supporters lauded him as the charismatic Ethnarches (National Leader). Some of his left-wing opponents have accused him of condoning rightist "para-statal" groups, whose members undertook Via kai Notheia (Violence and Corruption), i.e., fraud during the electoral contests between ERE and Papandreou's Center Union party, and were responsible for the assassination of Gregoris Lambrakis. Some of Karamanlis's conservative opponents have criticized his socialist economic policies during the 1970s, which included the nationalization of Olympic Airways and Emporiki Bank and the creation of a large public sector. Karamanlis has also been criticized by Ange S. Vlachos for indecisiveness in his management of the Cyprus crisis in 1974 even though it is widely acknowledged that he skillfully avoided an all-out war with Turkey during that time. Karamanlis is recognised for his successful restoration of Democracy during metapolitefsi and the repair of the two great national schisms by legalising the communist party and by establishing the system of parliamentary democracy in Greece. His successful prosecution of the junta during the junta trials and the heavy sentences imposed on the junta principals also sent a message to the army that the era of immunity from constitutional transgressions by the military was over. Karamanlis' policy of European integration is also acknowledged to have ended the paternalistic relation between Greece and the United States. On 29 June 2005 an audio-visual tribute celebrating Konstantinos Karamanlis' contribution to Greek culture took place at the Odeon of Herodes Atticus. George Remoundos was the stage director and Stavros Xarhakos conducted and selected the music. The event under the title of Cultural Memories was organised by the Konstantinos G. Karamanlis Foundation. In 2007 several events were held to celebrate 100 years since his birth. ^ a b "charismatic patriarch at the helm". Archived from the original on 27 September 2007. Retrieved 8 August 2006. ^ a b Laurence Stern, The Wrong Horse, (1977) p. 17. ^ "Kathimerini on the Merten affair". Archived from the original on 30 September 2007. Retrieved 12 July 2006. ^ a b c Greece's Gain Time Magazine Archives Quote: "While it was Rallis who hailed the new membership and its promise, much of the credit belonged to former Prime Minister and now President Constantine Caramanlis. For him, entry into the Community was the fulfillment of a dream, a sealing of what he calls "Greece's European destiny." In his view, being part of the democratic Western European family of nations should help ensure political stability for a country crushed by military dictatorship from 1967 to 1974." ^ a b c d e f g h "Athens News on: Destination Europe". Archived from the original on 27 September 2007. Retrieved 7 August 2006. 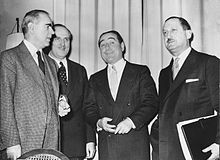 ^ "Karamanlis' personal contacts with the German and French leaders (Konrad Adenauer and De Gaulle), to shift Greek foreign policy towards stronger ties with the nascent (EEC)". Archived from the original on 27 September 2007. Retrieved 8 August 2006. ^ Clogg 1987, p. 40. ^ Clogg 1987, pp. 42–43. ^ Clogg 1987, p. 43. ^ Clogg 1987, pp. 43–44. ^ Clogg 1987, p. 44. ^ Alexis Papachelas, "Constantine Speaks", TO BHMA, 29 January 2006. ^ C.L. Sulzberger, "Postscript with a Chinese Accent," Publisher MACMILLAN PUBLISHING CO, 1974, p. 277. ^ Mega channel television, Gkrizes Zwnes, 2001"
^ "Economy and Statism". Archived from the original on 9 October 2007. Retrieved 16 March 2007. ^ "Karamanlis was sworn in as the country's first elected president on 6 May". Archived from the original on 27 September 2007. Retrieved 8 August 2006. ^ Ange S. Vlachos, Graduation 1974, Oceanis 2001. ^ a b c Hellenic Foundation of European and Foreign Policy Quote: "Quote: "Ο Κωνσταντίνος Καραμανλής, παρά τους δισταγμούς του Χένρι Κίσινγκερ στην Ουάσιγκτον, επέστρεψε από το Παρίσι τα χαράματα της 24ης Ιουλίου του 1974 και ανέλαβε την τεράστια ευθύνη της αυθεντικής εδραίωσης των δημοκρατικών θεσμών στην τόσο ταλαιπωρημένη του χώρα. Η μετάβαση στη δημοκρατία έγινε με τρόπο υποδειγματικό από τον Ελληνα Μακεδόνα ηγέτη. Οι δύο μεγάλοι διχασμοί του 20ού αιώνα γεφυρώθηκαν με τη νομιμοποίηση των κομμουνιστικών κομμάτων και με το δημοψήφισμα για το πολιτειακό που καθιέρωσε το σύστημα της προεδρευόμενης δημοκρατίας. Οι δίκες των πρωταιτίων της χούντας με αυστηρότατες ποινές (ισόβια δεσμά) πέρασαν το μήνυμα στις ένοπλες δυνάμεις ότι η περίοδος της ατιμωρησίας των αντισυνταγματικών παρεμβάσεων του στρατού στην πολιτική είχε περάσει ανεπιστρεπτί. Και χωρίς αμφιβολία, το μεγαλύτερο επίτευγμα του Καραμανλή ήταν η ένταξη της Ελλάδας στην Ευρωπαϊκή Κοινότητα (σήμερα Ευρωπαϊκή Ενωση) την 1η Ιανουαρίου του 1981. Ισως περισσότερο από οποιαδήποτε άλλη εξέλιξη η ένταξη της Ελλάδας στην Ευρώπη άλλαξε τη μορφή και την ποιότητα της ελληνοαμερικανικής δυαδικής σχέσης. Η πατερναλιστική κατατομή προστάτη – προτατευόμενου θα περνούσε έκτοτε μέσα από ένα διαρθρωτικό φίλτρο με το όνομα «Βρυξέλλες»."" ^ Britannica Konstantinos Karamanlis: Greek statesman who was prime minister from 1955 to 1963 and again from 1974 to 1980. He then served as president from 1980 to 1985 and from 1990 to 1995. Karamanlis gave Greece competent government and political stability while his conservative economic policies stimulated economic growth. In 1974–75 he successfully restored democracy and constitutional government in Greece after the rule of a military junta there had collapsed. ^ "Karamanlis' unflinching political orientation towards the unification of Europe". Archived from the original on 27 September 2007. Retrieved 8 August 2006. Clogg, Richard (1987). Parties and Elections in Greece: The Search for Legitimacy. Duke University Press. ISBN 9780822307945. Wikimedia Commons has media related to Konstantinos Karamanlis.